[SBS Star] BTOB Lee Changsub Turns into a Hot Chestnut Seller for Fans! 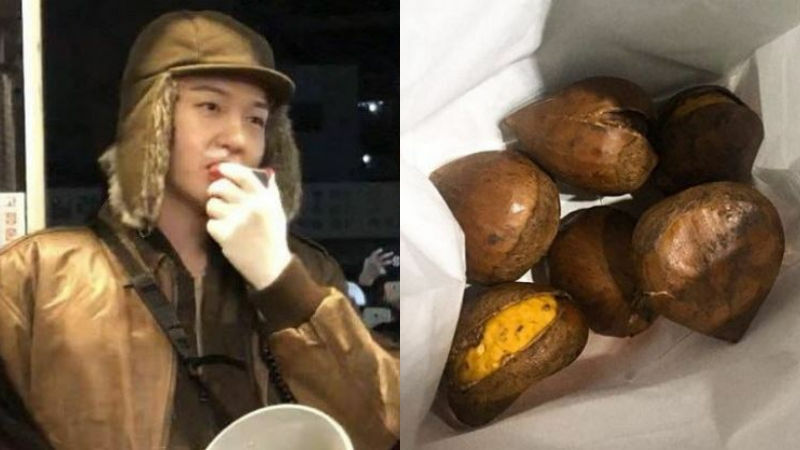 K-pop boy group BTOB's member Lee Changsub surprised his fans with a heartwarming gift―a hot chestnut that he roasted himself. On December 5, Lee Changsub held a surprise event in front of his agency CUBE Entertainment's cafe. For this event, Lee Changsub turned into a hot chestnut seller, roasted chestnuts himself, and gave them to his fans as a present. His fans who heard the news through BTOB's official social media account headed to the venue right away, so it didn't take much time for him to gather a lot of people. Lee Changsub showed up at the venue just like a chestnut seller―with a hat, a brown jacket, cargo pants, and a megaphone to make it seem more real. His fans burst into laughter when they found out the fact that he added a bit of makeup to look like he has a runny nose. Lee Changsub put the hot chestnuts in a bag, and handed out to his fans one by one. Upon seeing the pictures taken at the event, people who couldn't make it there commented, "I would've gone there if my house was closer. ", "His fans must've loved it. ", "He looks like a real hot chestnut seller. ", and many more. Meanwhile, Lee Changsub will release his solo debut album 'Mark' on December 11.